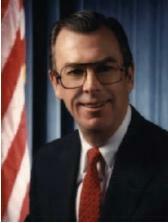 Justice James Ryan was appointed to the Supreme Court in 1975 by Gov. William Milliken (R). He was elected to the Court in 1976 and re-elected in 1978. He resigned in 1985 after appointment to the federal Sixth Circuit Court of Appeals. Justice Ryan earned his undergraduate and law degrees from the University of Detroit. He served as a Judge Advocate General in the U.S. Navy from 1957 to 1960, and continued to serve as a certified military judge until 1992. He was elected Redford Township Justice of the Peace in 1963 and to the Third Circuit Court of Appeals in 1966. He served as a federal appellate judge in the Sixth Circuit Court of Appeals from 1985 to 2010, and has been an adjunct law professor at the University of Detroit Law School, the Thomas M. Cooley Law School, and the Ave Maria School of Law.